Austro-English rabbinical scholar and preacher; born in Lemberg 1827; died in London 1903. His family claimed to trace its ancestry back to the exilarchs through Solomon Luria and Moses Isserles. Ẓedeḳ was instructed by Joseph Saul Nathansohn, chief rabbi of Lemberg, and attended also the yeshibah of Joseph Yekeles, rabbi of Yavorov. 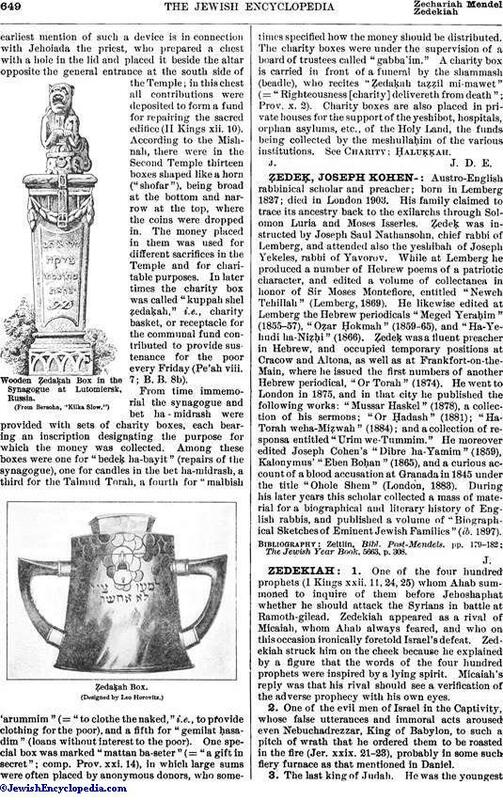 While at Lemberg he produced a number of Hebrew poems of a patriotic character, and edited a volume of collectanea in honor of Sir Moses Montefiore, entitled "Neweh Tehillah" (Lemberg, 1869). He likewise edited at Lemberg the Hebrew periodicals "Meged Yeraḥim" (1855-57), "Oẓar Ḥokmah" (1859-65), and "Ha-Yehudi ha-Niẓḥi" (1866). Ẓedeḳ was a fluent preacher in Hebrew, and occupied temporary positions at Cracow and Altona, as well as at Frankfort-on-the-Main, where he issued the first numbers of another Hebrew periodical, "Or Torah" (1874). He went to London in 1875, and in that city he published the following works: "Mussar Haskel" (1878), a collection of his sermons; "Or Ḥadash" (1881); "Ha-Torah weha-Miẓwah" (1884); and a collection of responsa entitled "Urim we-Tummim." He moreover edited Joseph Cohen's "Dibre ha-Yamim" (1859), Kalonymus' "Eben Boḥan" (1865), and a curious account of a blood accusation at Granada in 1845 under the title "Ohole Shem" (London, 1883). During his later years this scholar collected a mass of material for a biographical and literary history of English rabbis, and published a volume of "Biographical Sketches of Eminent Jewish Families" (ib. 1897). The Jewish Year Book, 5663, p. 308.